Nutanix has recently published a Best Practice Guide for Mictosoft Exchange on VMware vSphere and Josh Odgers explains some of it’s contents and benefits of Exchange on Nutanix in his blog article here. If you are interested in virtualizing Exchange, and/or using Nutanix, you might want to get hold of the guide and have a read through it. It explains how to simply set up Exchange on Nutanix, the benefits of it, how it compares to a traditional physical JBOD approach and much more. 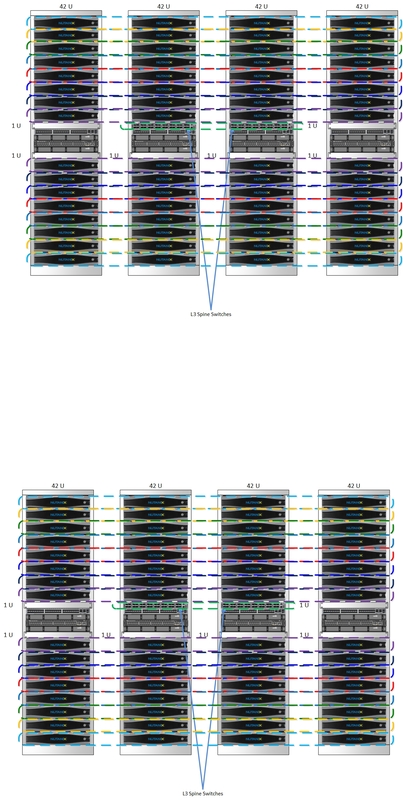 The paper introduces the capability of running Exchange on the Nutanix NX-8150 nodes, which have been specially designed to run large applications, such as Exchange, SQL Server, Oracle and SAP. This is the node type Josh Odgers and I used as part of a design capable of hosting 1.4 million Exchange 2013 Mailboxes, which demonstrates the building block architecture of Nutanix and the ability to scale to meet requirements for large environments. Let’s take a look at that design at a high level. This design was created as part of a response to an RFI (Request For Information) for a customer in Europe. They wanted to support 1.4 million Exchange 2013 mailboxes at 500MB each with 50 messages per day. The number of messages per day and the size of mailboxes can be adjusted by adding more nodes to the design. 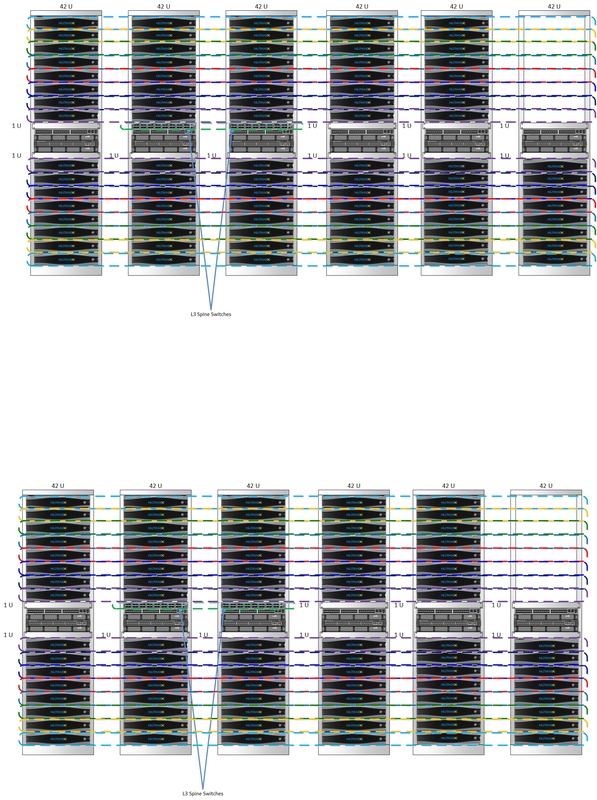 The Nutanix NX-8150 nodes (1 node per 2RU) used in the below example are configured with 2 x E5-2690 v2 sockets (10 cores each @ 3GHz) and 256GB RAM. 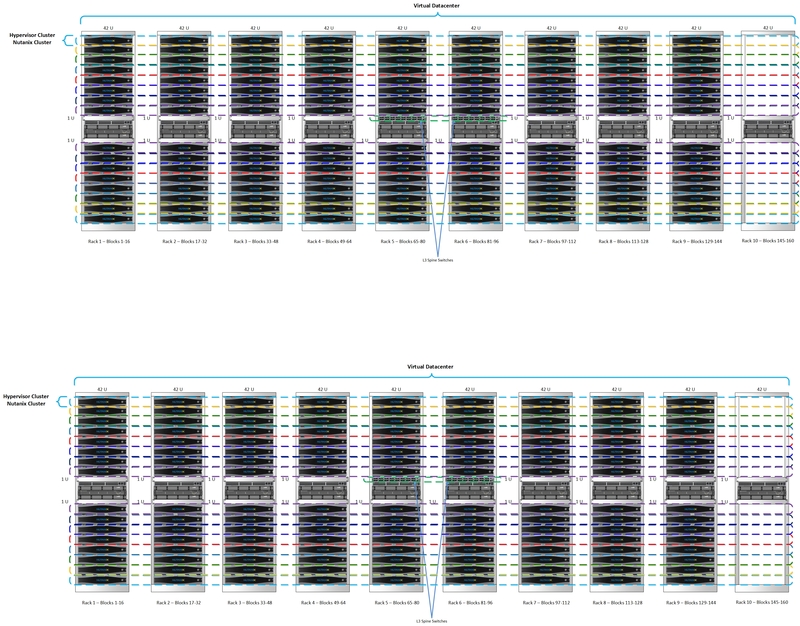 They each have 10TB usable capacity per node before any dedupe or compression benefits, and can be configured with up to 6.4TB of raw flash capacity per node (3.2TB raw flash per node used in this example). 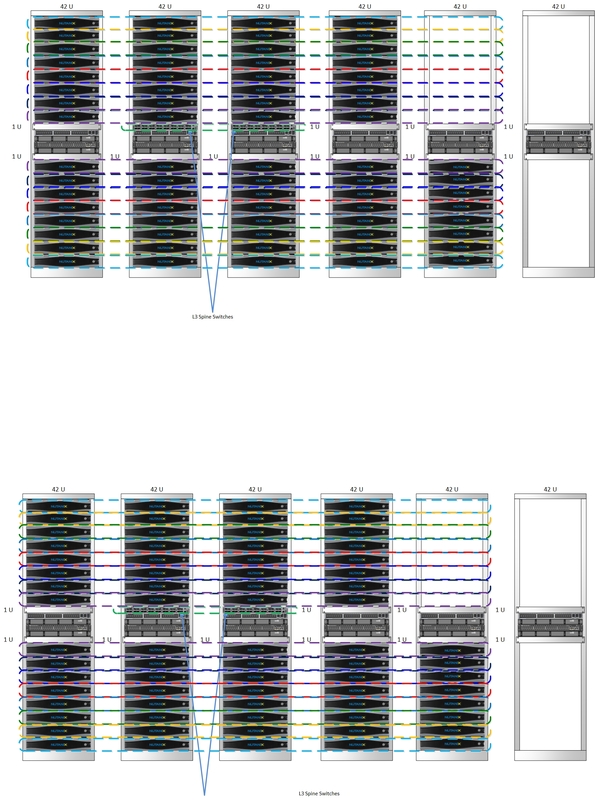 Note: Diagrams are not exactly to scale as there are additional RU remaining unused per rack. 8. 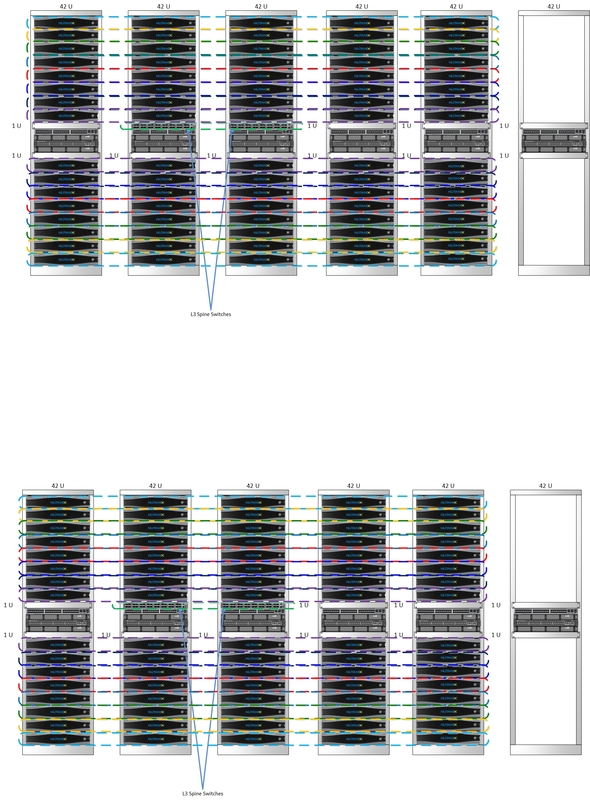 A total of 10 racks required per site (20 racks in total). The entire Nutanix environment can be managed across both data centers from a single management console (PRISM Central). 4. Start with 8 nodes per DAG and 4 dags (32 nodes per site) for a total of 64 Nodes across both active/active sites (~300K mailboxes @ ~4688 per node), grow by additional 64 nodes, then 16 nodes (~75K mailboxes) at a time until final configuration is met. It is easy with Nutanix to start much smaller and design exchange environments for much lower number of mailboxes (or much larger mailbox size) and for smaller growth increments (<500 – > 2000 mailboxes). This example was for a very large environment and specific customer requirements, and shows for this large environment a small(ish) starting point and growth increments, until it reaches it’s final size. The diagrams include all compute, storage and networking equipment required to host the specified number of mailboxes. At the time of publishing this article the outcome of the RFI that this design was created for is unknown. If Nutanix is successful and the customer agrees to be a reference you’ll be sure to hear about it. 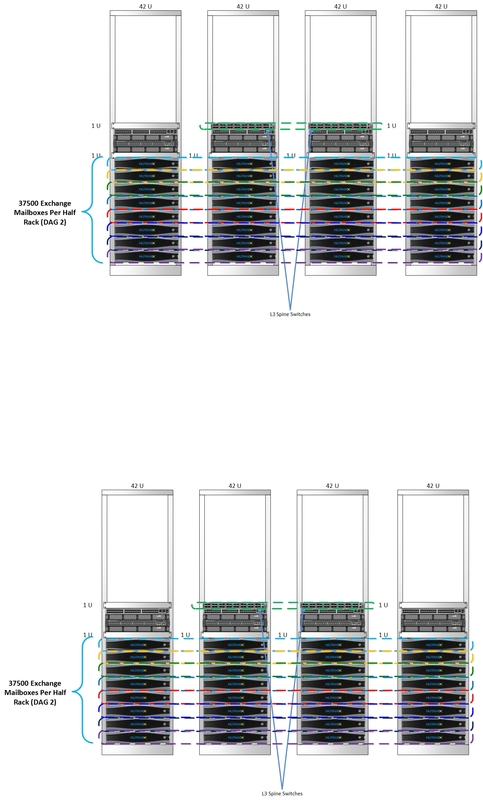 The purpose of this article was to show at a high level how you could use Nutanix NX-8150’s and a building block approach to design a large scale environment suitable for Exchange. Although the target for this design, and the Exchange Best Practices paper is VMware vSphere you could also use Microsoft Hyper-V (Nutanix Exchange Best Practice Guide on Microsoft Hyper-V is in the works). Great writeup Michael. Really gives insight into the running Exchange on Nutanix. Thank you for a great write up . Question that may help dispel some FUD here – would this be a supported Exchange 2013 deployment? MS has a support statement about no support for network storage even if it is presented to guests as block storage, which seems to impact Nutanix directly. I would love any help in making that concern go away…..
Hi Paul, Sorry it appears i never got back to you and answered your question. Microsoft supports iSCSI storage for Exchange directly. So using block storage to the VM is fine. Microsoft doesn\’t like NFS storage for Exchange, but it\’s fine for SQL Server, there is no technical reason for this, in special cases Microsoft has supported NFS, but for a fully supported solution iSCSI to Exchange is the way to go.